CCMT Counselling 2019 for M.Tech./M.Arch./M.Plan./M.Des. Admissions - Sarkarinewjob.com A ultimate job portal to provide employment news. 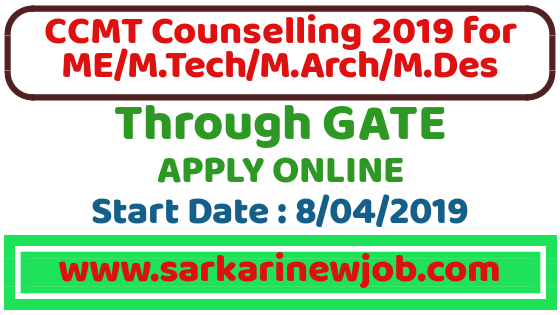 The Centralized Counseling for M.Tech./ M.Arch./ M.Plan./M.Des. (CCMT-2019) is a platform for candidates to apply for M.Tech./ M.Arch./ M.Plan./M.Des. programmes, based on their GATE score of years 2017, 2018 and 2019, in all National Institute of Technologies (NITs), IIEST Shibpur, 7 IIITs, National Institute of Foundry and Forge Technology (NIFFT) Ranchi, School of Planning and Architecture (SPA) Vijayawada, University of Hyderabad, Central University of Rajasthan, Sant Longowal Institute of Engineering and Technology (SLIET) Longowal, Punjab Engineering College (PEC) Chandigarh and Shri Mata Vaishno Devi University Katra. This centralized system provides a common and convenient platform for online counseling wherein the candidates can fill-in single online application form from their homes and apply to all programmes in all the participating institutions to which they are eligible. The candidates are not required to apply to individual Institutes or go to every Institute for appearing in interview/counselling. Thus, the CCMT-2019 enormously increases the overall convenience of candidates. The CCMT was initiated in the year 2012 for centralized admission for PG programmes and since then has undergone several changes to make it more student-friendly and included newer institutions under its umbrella. In the CCMT-2019, new features such as online withdrawal and willingness change etc. have been incorporated. The governmental reservation policy on Economically Weaker Section (EWS) is also implemented by many of the participating Institutes/University. Moreover, candidates are allowed to participate in both regular round and the National Spot Round (NSR) even if one has obtained a seat in the regular round. The CCMT-2019 is being organized by National Institute of Technology Rourkela. All the prospective candidates are advised to read the information brochure and various other documents given in this website carefully and apply.